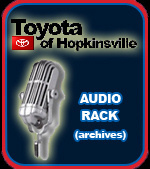 Located at 4395 Fort Campbell Boulevard, Toyota of Hopkinsville is a major sponsor of sports on WKDZ and Trigg County athletics. Cadiz Auto Parts is your local NAPA and Stihl dealer. They are located at 1969 Main Street. Scott Brown handles most of the sports duties for Ham Broadcasting. In addition to providing daily sports news on this blog, he broadcasts high school football, basketball, and baseball games on WKDZ and WHVO. He also hosts the Saturday Morning Sports Report on WKDZ -- one of the few local sports programs in the area. His local sports has been the most read in Trigg County for several years. Click here to listen to past Trigg County and Fort Campbell football games, as well as the Saturday Morning Sports Report. All written entries and pictures posted on this blog are copyrighted under the Copyright Act of 1978. Yes, that means blogs are covered under the Copyright Protection Act and you can't copy and paste to your blog or newspaper without giving the proper credit. Click here to learn more about copyrights.